The Multi-Sport Chelsea Piers Passport is designed for adults and children who are interested in sampling the wide variety of activities available at Chelsea Piers. To purchase a Multi-Sport Passport, visit the Front Desk at the Golf Club, located on Pier 59. Passports are available for purchase Monday-Sunday during the hours of 7:00am - 11:00pm. Click here for Terms and Conditions pertaining to the use of Passports. Passports may not be used Monday - Friday from 8:00am - 5:00pm during Summer Camp. Passports are not valid at any time for groups of 5 or more. 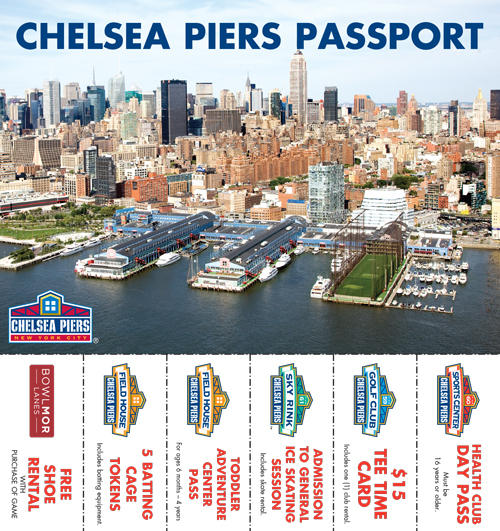 PLEASE NOTE: Coupons must remain attached to the Passport; coupons may only be removed by Chelsea Piers staff. Detached coupons will not be honored. Day Pass to our Fitness Club, Chelsea Piers Fitness. Enjoy the swimming pool, Hudson River sundecks, basketball courts, 1/4-mile indoor track, an extensive collection of cardio and strength-training equipment and a variety of group fitness classes. Chelsea Piers Fitness is an adult membership facility. Guests must be 16 yrs. or older. $15 pre-paid Ball Card and club rental at the Golf Club, a 200-yard net enclosed, heated and weather protected driving range. Admission and skate rental at Sky Rink, Manhattan's only year-round, twin indoor ice skating rinks. Five (5) batting cage tokens at the Field House (50 balls). Admission for one child and an accompanying adult to the Field House's Little Athletes Exploration Center. For ages 6 mos. - 4 yrs.